Psalm 103 has 22 verses, just as the Hebrew alphabet has 22 letters. 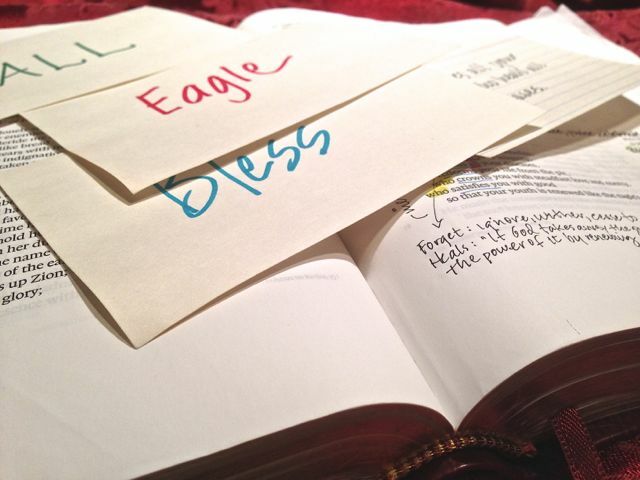 We’ve studied two acrostic passages in past Busy Mamas Bible studies. Proverbs 31, which we studied in July, is an acrostic poem, and Psalm 37, which we studied last March, is also acrostic. Each verse of the passage starts with the next letter of the Hebrew alphabet, so that the entire alphabet is used by the end of the passage. An acrostic represents completion or the whole picture — everything from A-Z on the subject. The alphabetical arrangement also functions as a memory aid. Although Psalm 103 does have 22 verses, they are not arranged in an alphabetical order. But as an aid for ourselves, as we work on memorizing the psalm, we’re going to come up with an alphabetical arrangement of words to help us remember each verse. If you are using the children’s assignments, you can do this along with your children today, if you’d like. Assignment: Pray, thanking God for His Word and for His great blessings in your life. Ask for His help in committing Psalm 103 to memory. Then start reading the psalm. Think of a word starting with the letter “A” that represents some portion of Psalm 103:1. This will simply function as a memory clue for you. The word will be one of twenty-two different cues to guide you through the entire psalm. “All” would be a pretty easy word to assign this verse, since we are told to bless the Lord with all that is within us. In your notebook, write the number 1 and the word all, or print out a copy of the psalm and write the word all in front of the verse. Move on to verse 2. Read it and assign a cue word to it that starts with “B”. How about “bless”? Record this word (or another “B” word of your choice) for verse 2. Besides providing clues for your memorization, this exercise also helps you stop and summarize what each verse says in order to make a clue that relates to the verse. Verse 3 will take a bit more creativity. We’ll have to use a word that is not actually in the text of the verse, but a word that helps us remember the words or theme of the verse. The next thing to do is make some flashcards to help you with your memory work. If you’re doing the children’s lessons, do this along with your children. If you aren’t using the children’s lessons, make a set of cards by writing each verse on a separate card, and then writing your cue words on the other side of the cards. To test yourself, arrange the cards in order and only look at the cue word for each verse while you recite the verse. Explain what you worked on in your own lesson today. Read a verse and tell the children what your cue word is for that verse. Read another verse and tell them that cue word. Work your way through the psalm this way. If your children are old enough, you might want to help them think up their own set of cue words. Otherwise, work with them to make a set of flashcards using your cue words. Let the younger children write the cue words on one side of the cards, and the older ones can write the verses on the other side. Just do half of the verses today, if you think all twenty-two will be too much for one day. Use the catch-up day tomorrow to finish them up. When you are all done, put the cards in order with the cue words facing you, and test yourselves. When you get stuck, turn the card over, read the verse aloud, and work together on memorizing it. Any ideas for Q and verse 17? How about quality because His love is lasting. I’d love to see what other’s put down for their alphabet! As a list-maker and poor memorizer, I LOVE this!